Robert Lewandowski Net Worth: Robert Lewandowski is a Polish soccer player who has a net worth of $45 million. Currently he plays as a striker for the German Bundesliga club Bayern Munich and the Polish national team. Robert Lewandowski was born in Warsaw, Poland on August 21, 1988. He was the top goal scorer in both the third and second tiers of the Polish league while with Znicz Pruszkow, scoring 21 goals in 32 appearances. He moved to Lech Poznan, and was again the top goal scorer as the club won the 2009-10 Ekstraklasa. In 2010-11, Lewandowski moved to Borussia Dortmund. Overall, he's scored 165 goals in 301 club matches. For the Poland national team, he's netted 18 goals in 56 appearances. Other club honors include two Bundesliga championships with Borussia Dortmund in 2010-11 and 2011-12 and the DFL Supercup in 2013. 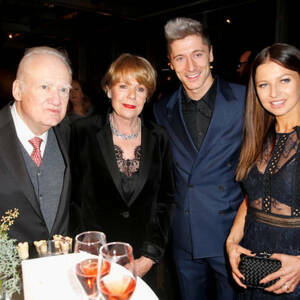 Individually, Lewandowski has earned a number of honors as well: in addition to being the top scorer in various lower-tier leagues, he was the Bundesliga Top Goalscorer in 2013-14, putting 20 goals through the net. In 2008, he was the Polish Revelation of the Year; in 2009, he was the Ekstraklasa Player of the Year. He's been named Polish Player of the Year three times in a row, in 2011, 2012 and 2013.